You can find out more about our learning by visiting the curriculum section of our website. The children in Reception have been introduced to their new friends ‘Ronnie and Rosie’. The mascots love going home to spend the weekend with the children. Tuesday’s are very exciting in Reception because everyone gets to hear about the fun and exciting things Ronnie and Rosie have taken part in during the weekend. We love art in Reception and this week we painted self-portraits! We each used a mirror and looked carefully to identify the different parts of our faces that we needed to paint. We are very lucky at Copeland Road Primary School to have our very own apple and pear trees. Today we were so excited to pick the fruit from the trees! We also took out our clipboards so that we could do some observational drawing. When we ate the apples we were amazed at how juicy they were! The pears were delicious too! One of the children brought in a pizza menu today and enjoyed asking her friends “what are you ordering?” The children were excited about eating pizza during registration – “the pizza is hot” and the “pepperoni is tasty”. Reception also worked together to change the home corner into “a pizza kitchen”. Child-initiated experiences can allow lots of learning to take place and can help build children’s self-confidence. All the children were engaged and we all enjoyed our morning! Each week we get to spend time in the Library. We love finding our favourite books and discovering new ones, especially the big non-fiction books! We also get to choose a book to take home, it is lots of fun! In Reception we are very lucky… we get to have a Year 6 Buddy! Our buddies are very kind and they help us feel happy and safe at school. They help us make new friends too! Each week our buddies come to visit us; they read us stories and play with us. Thank you buddies for all you do! We really enjoyed our walk today… the leaves were crunching, the trees were rustling and conkers covered the field. We filled our pockets with conkers of all shapes and sizes and we were amazed by the vibrant colours of the leaves. In Reception we love stories! Stories help develop our imagination and provide us with ideas for our play activities. Today we read a story called Pumpkin Soup. We enjoyed the story so much that we made our own pumpkin soup in the sensory tray and pumpkin pies too! Some of us acted as monsters, wizards and witches and these are characters from other stories we are enjoying. This week we have been practising our cutting skills by cutting out different shapes for our pumpkins’ faces. We cut out triangles for the eyes and stalk and then we designed our own shapes for the mouth. We are really proud of our work because we tried really hard to use the scissors effectively. We hope you like our pumpkins too! We have been learning about the soldiers who have fought in the war and we thought it would be a good idea to make poppies to show our respect. It has been Bonfire Night this week and all the fireworks we have seen have been “big and sparkly” and they “made a bang noise”. We made pictures of the fireworks using glitter for the sparkles and bright coloured paint because we saw lots of “really colourful” fireworks too! Chris Bostock visited our school today and he shared a wonderful story about a little possum who is trying to get food for his poorly mummy. The children thoroughly enjoyed the story as Chris told the story with enthusiasm and used clapping rhythms to help us feel even more a part of the story. We also were given a challenge… we had to work out what little possum could see when he was looking into water. We went outside and we all looked into a puddle of water and worked out that little possum was scared of his own reflection! 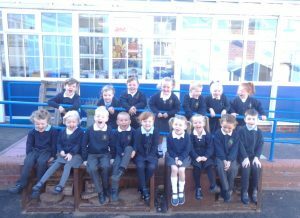 So much learning took place for the children today – it has been fantastic to see. We have had a great day today. We used our imagination and creativity to think of an elf name for each of us; it was very funny being called by our elf names! In the morning we made some elf crispy cakes. It was fascinating to watch the chocolate melt and we took turns to mix the ingredients together. In the afternoon, we enjoyed watching the ‘Elf’ movie whilst eating our delicious elf crispy cakes. One of our favourite stories at Christmas time is The Polar Express. We were so excited to have a Polar Express day at school and this year our Year 6 Buddies joined in with the fun! We changed into our cosy pyjamas, cuddled our teddies tightly and boarded The Polar Express! We enjoyed some hot chocolate and even had a surprise visit from Santa Claus. It was a fantastic day! Reception enjoying their first Christmas Lunch! Reception had a wonderful time at their first Christmas Lunch since joining Copeland Road School. This afternoon we made chocolate cakes with our Year 6 Buddies! They helped us weigh out the correct ingredients and we took turns with mixing. When we added the cocoa powder it was amazing to see the mixture turning chocolatey and cracking the eggs was so much fun! Thank you Buddies, our cakes tasted delicious! Today we explored the icy outdoors! The grass was “crunchy” and the icy leaves and frozen sticks were “stinging to touch”. We couldn’t believe how “frozen” and “hard” the ground had become from the heavy frost. We really enjoy spending time outdoors and connecting with the natural world. Mrs Torano visited Reception today and brought her guitar too! We named the different parts of a guitar, counted the strings and learnt about “the hole in the middle”. It was amazing sound when Mrs Torano played the guitar and we enjoyed singing songs with her. The best bit of all was when we each played a ukulele! We love music and learning about new instruments, thank you for today Mrs Torano!